Guest Segments: Evana Roth, whose husband faked his own death and Viola Davis, Maggie Gyllenhaal, Rosie Perez and Oscar Isaac - the cast of the upcoming film, "Won't Back Down." Could you pleaaaaase post the whole part with the cast of "won't back down" ? Thanks again for all these videos. The only part of today's show that I liked was the first 15 minutes, and usually I find that to be the worst part of the show. 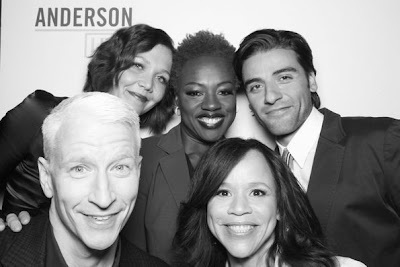 I didn't really know who the co-host was, but she did ok. Viola Davis was great and I agreed with much of what she had to say but Anderson didn't seem to give much time to the other co-stars to talk. The First 15 is good because AC's more relaxed and open during that segment. We'll post the full interview with the cast of "Won't Back Down" in tomorrow's 'Extras'. While I agree that Viola Davis is a great actress and should have won an Oscar for her supporting role in Doubt, the premise of "Don't Back Down" is, way off the mark. Parents in a movie can take over a school system. In real life Parents need to focus on their own children, not the entire system. If everyone was able to teach, they would. Just because everyone went to school, doesn't mean they can teach. Teaching in the inner city is especially difficult and if you think anyone can just walk in, and "control the class," I'd like you all to try, for one day. and "control" is the number one problem....they cannot control the children in order to teach them. This is a real life, fairy tale. Of course Anderson doesn't know this, because he never went to public school in the first place. I had to Google Katherine Schwarzenegger to find out who she was besides being the daughter of Ahnuld and Maria. She did write a book about women and body image. Katheriine graduated from USC, Anderson should have asked what her major was. Katherine was okay as co-host but lacking in substance or ... I don't know how to phrase it. Compared to the other co-hosts, she is so 'blank slate', no real history or identity other than having famous parents. But Anderson got along with her well. Could someone who watched the whole show tell me how Katherine was in the interviews? @Jaanza Katherine didn't participate in the interview portion with the movie cast as that was pre-taped Monday afternoon - not sure why. She was pretty quiet during the other interview segment. She may have asked one question - but she sat on stage with the guests and Anderson went into the audience to take questions in the second part of that guest segment.